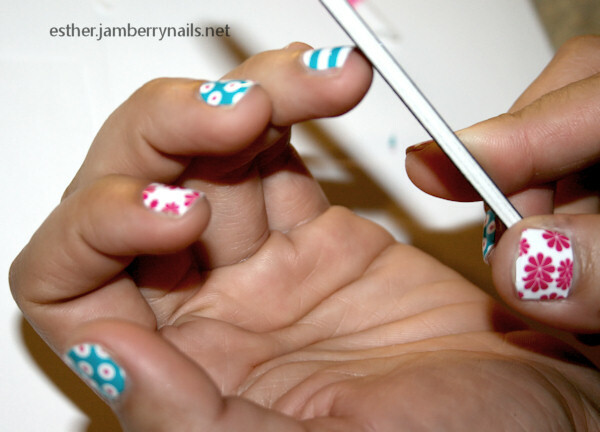 After experimenting Jamberry nails for the first time, I am eager to write my review about Jamberry Nails (if you want to know what Jamberry Nails are, read “Jamberry Nails“) and tutorial on how to apply the Jamberry nail shields. I used the manicure supplies and sample of Jamberry nails from the consultant kit. But you can purchase them at any nail supplies, such as EsthersNC.com. 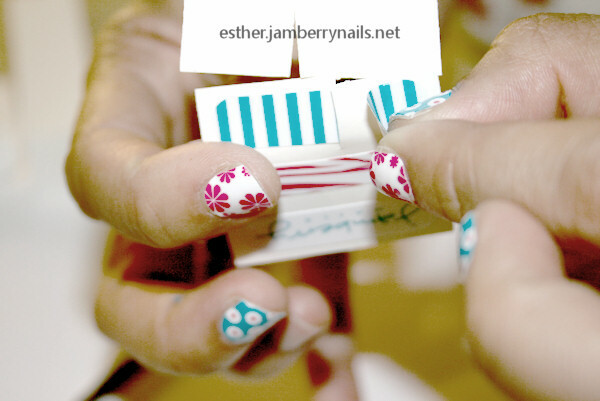 To purchase Jamberry nails, visit esther.jamberrynails.net. First of all, I need to let you know why I like Jamberry Nails. We’ve been selling nail products for over 7 years now and there are always new products with new technologies pop up in the market. First there was regular nail polish. Then recently we have popular soak-off gel polish and shellac that revolutionize the application and durability of nail polish. With gel polish or shellac, application is easy and nail polish can stay up to 3 weeks on nails. This is amazing compare to regular nail polish that, if lucky, can stay 1 week. The drawback is to do your manicure or pedicure at home you have to invest a lot of money in the beginning to buy more expensive nail polish and the lamp and the application can be overwhelming to some people. What I like about Jamberry Nails compare to other products is that they are very easy to apply and remove. I read the instruction for my first nail. Afterwards I pretty much could remember almost all the steps. Application has no harsh odor from nail polish, in fact no nail polish needed, it’s very easy on budget only $15 per sheet for 2 to 3 manicures, and long-lasting. It’s supposed to stay on finger nails for 2 weeks and toe nails for 6 weeks. Drawbacks always exist with any product, including the popular CND Shellac or Gelish. 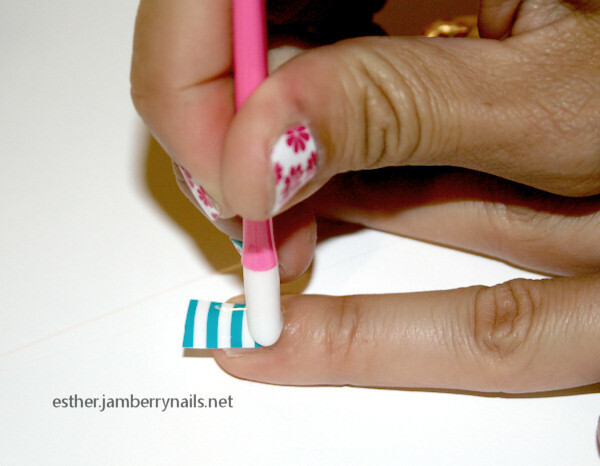 What I find hard using Jamberry nails..ehm…ehm…is that it’s hard to cover completely your nail bed. My nail is wider on the tip. This leaves some tiny spaces that can’t be covered by the shield. If you look closely you can see it clearly. The other problem that I just notice is that it’s very difficult to apply the shield as French Manicure tip. Has to cut it precisely and the shield is easy to lift up. Maybe it’s just my lack of practice. So I hope in the next catalog Jamberry will release some French Manicure designs. Step 1. Gather all your manicure supplies. The supplies are alcohol, nail file, cuticle pusher, sharp small scissor, hair dryer, nail buffer block, Jamberry nail shields, and the instruction available on the back of the nail shields. Step 2. Clean nails with nail polish remover or alcohol. (Clean, oil free nails are one of the most important steps of the application). I used Alcohol and it virtually has no odor (very low odor) so I felt comfortable working with it in a closed room. I like to clean one nail at a time and apply a shield right away. That way I will make sure the nail is clean before applying a shield. Step 3: Buff top of the nail to remove the shine and prepare the nail bed for optimal result. Then, push back cuticle. 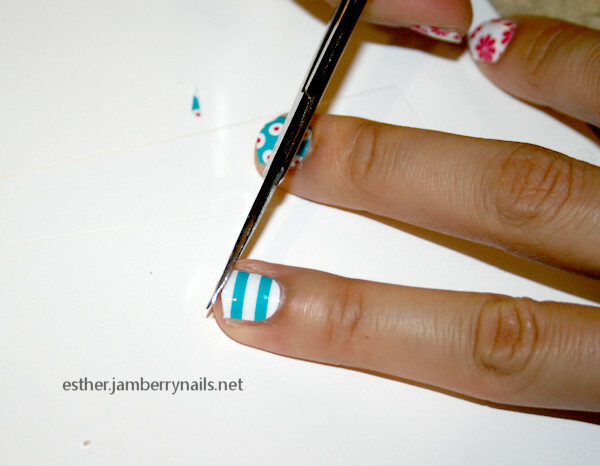 Step 4: Match nail (finger or toe) to the nail shield that best fits. It’s rather difficult to find a perfect match. If the paper is like a plastic transparent it would be easier I think. Basically, choose a shield in a size that won’t touch the cuticle area. If the shield covers the cuticle, it won’t stay long. Step 5: Cut and peel the nail shield. Cut it to the size you need. When peeling the shield, make sure sure you touch only the very edge of the shield that will be trimmed to minimize oil or dirt on the adhesive. You can also use a tweezers. But I find using hand is easier. Step 6: Warm it with a blow-dryer 10-15 seconds or until soft and flexible. I recommend to 20 second. Step 7: When warm, press the shield onto the nail. Apply firm pressure around edges to adhere the shield to the nail. 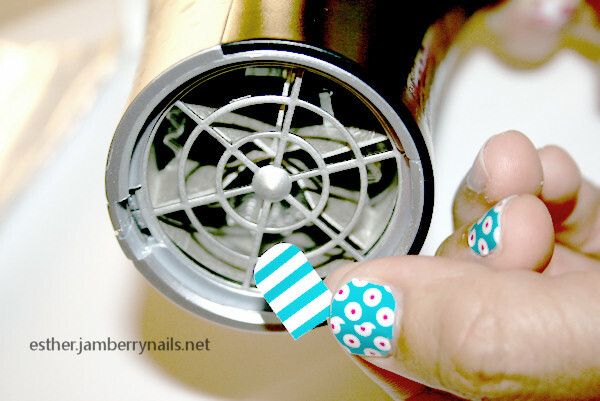 Use cuticle pusher to seal the shield around the cuticle. Do step 7, twice or 3 times to ensure long-lasting application. Step 8: Trim the top with scissors and file off remaining shield using a downward motion to remove excess. Sometimes a strand of the shield comes out when you file. That’s okay. Keep filing until the edge of the shield clean. You can see that the shield sticks very neatly on the nail. Step 9: Apply heat and pressure to the shield again. Repeating this step several times helps create a tight seal to the nail surface and increases wear time. I would do this twice before I move on the next one. No top coat needed. You’re ready to go. I was amazed at how easy to apply the nail shields. I noticed after a few minutes the shield on my pinky lifted a bit. So I warmed the shield and apply pressure on it. I am not sure why this happened. Maybe it needed more of the heat-and-pressure step. The next day, half of the shield on my pinky started to lift. However, since the tip part still stuck to the nail, the shield still looked good. The only problem was my hair sometimes got trapped underneath the shield so my hair got pulled many times. On day 4, the shield on one pinky peeled off without hurting my nail. The photos above shows the nail shields after 6 days. I use my right hand much more than my left hand. As you can see there are more tear and wear signs on the right ones. I noticed the shields around the cuticle on some nails started to lift off, causing my hair, lints, fabric strands got trapped underneath them. I really want to change my nails but I just have to be patient to see if Jamberry nails stand up to its claim. I’ll update this post to report how long Jamberry nails shields stay on my nails. Thanks for staying tune and feel free to comment below. On day 14, I took the shield that covered my pointer finger because my hair always got trapped under it. So after constant hair-pulling, I finally peeled it off. However, I was totally amazed on how some of the shields stayed after 14 days. You can see from the photo my nails’ growth. The shields started to lift off especially near the cuticle area. However, on the free edge, the shields sealed very well. I shouldn’t have peeled the shield as it strip off a little layer of my nail. 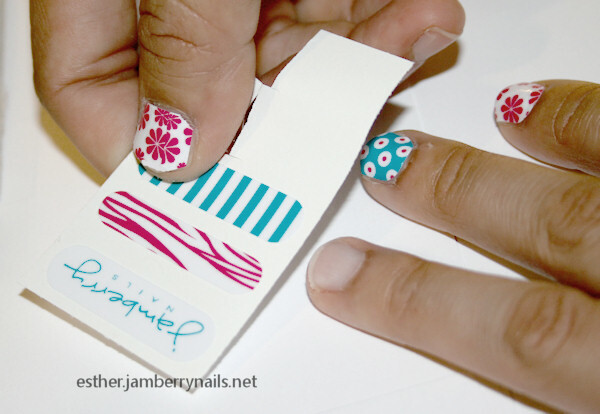 In summary, Jamberry nail shields really can stay up to 2 weeks on some nails but not all kind of nails. It also depends on the application process. So what to do if some nail shields peel off? Just apply nail polish to fill the empty spot or re-apply the shield. Applying nail shield shouldn’t take long so in a few minutes you’ll be ready to go. I just want to point out that the sample nail shields which consultants give out are meant for one or two nails … not meant to do an entire set. hi,thanks for pointing that out. That’s true the sample are for a few nails and won’t cover thumb nails. these look really bad…. yikes! I have to admit the application is not as good as other jamberry fans since this is my first trial..:-)..I just hope it won’t hinder you to try Jamberry nails :-))). Go with a larger shield and then trim the top down. I find that using small fingernail clippers gives it a better look than scissors. It’s less edgy if that makes sense. Also, if you push the cuticle back, or essentially, lift the cuticle, you can apply the nail shield a little above where your nail ends, then push the end under where you raised the cuticle. It’ll help disguise nail growth. These can look good, and practice makes perfect. maybe it peeled near cuticle because you used your fingers to lift it, getting on the shields? Hi I am posting for my wife. She had the jamberry nail art on her toe nails for about 2 weeks. She just removed the big toe nail. And it took off the top half of her toenail. It looks bad and she said it hurts bad also. I have used Jamberry nails for quite some time. I love them. I have more rounded nails, than the flat ones shown, so I usually use a top coat to keep them on longer, which helps it not to pull my hair. Rounded nails need a few more touch ups every so often. Just found out you can use gel top coat with it (and a UV light) for longer lasting, sturdier and acrylic looking nails! The sheet she has is a sample sheet. The wraps actually come on a clear sheet when you buy them so you can easily match to the right size nail. NEVER pull the nails off! This will take layers off your nail. Sally Hansen has a nail hardener and nourishment that helps get them back to healthy if they get damaged. Give your nails a break every so often to keep them healthy (Do the same with acrylic or nail polish). 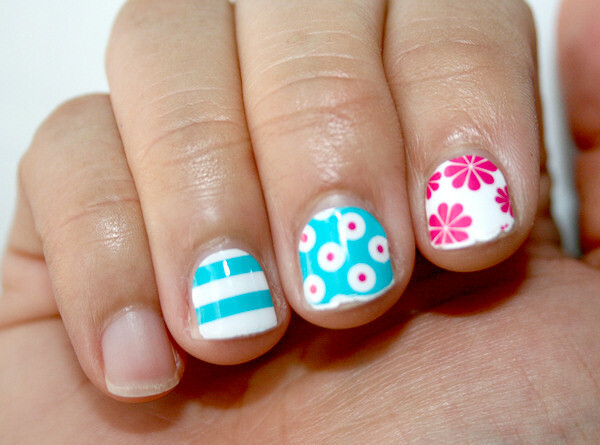 Soak your nails in nail polish remover to gently get them off, and work it off with tweezers, not pull it. I have had some that lasted 3 weeks! You can get up to 4-5 uses from one sheet if you do 2-3 full nails applications and then 1-2 using just tips. Can’t get enough of them. Only bad thing is they rotate styles, so some of my favorites are gone! Still love them though.